Nothing is more important in business than knowing that your business is in a strong financial position and poised to do what you want in terms of growth, milestones and goals. If I was a betting man, I would bank on leads every time over any other thing in business. Quality, predictable and consistent lead flow is the lifeblood of small business and the major factor to every business success I know of. How consistent are your leads? What can you rely on each and every week for leads to work with in your business? How consistent are the numbers each week? Do they fluctuate quite a bit? The consistency of the lead flow greatly affects your ability to manage and scale. If you don’t know how many leads you are going to get, you are constantly battling with human capital needs (overflow or underworked employees). Knowing what to count on is half of the battle because you can plan for the leads with infrastructure. You need predictable leads. What does that mean? It means that you know when certain events happen, you get more leads. This is most often achieved by PPC )Pay-Per-Click advertising. It is a faucet that you can turn on and off at will. SEO can work the same way if you hold good authority in the eyes of the search engines. A great example of this is this case study on blog posts and infographic. At the end of the day, knowing how to get more leads if you need them is a great way to be able to scale. Closing rate – How many deals close versus how many leads come in indicates the viability of the lead source as a long term lead solution. Dollar amount – The average dollar amount of the deals closed indicates how valuable the lead really is to the business. Length of sales cycle – Length of sales cycle indicates the disposition and readiness of the prospects. If you do not have these things, it is likely that your marketing has disjointed, in-congruent or weak lead quality. You are likely familiar with the sales funnel. It shows you what your lead flow looks like at a glance and it reveals where the bottlenecks are happening and how you can optimize your lead flow. The goal of the marketing and lead generation process is to create marketing and lead flow solutions that make each visit turn into a lead as much as possible and each lead turn into a customer as much as possible. I call this the sales cylinder. This is because if that were true, then the image would not get narrower as the process moves down. 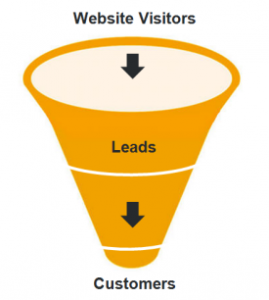 The reason for this explanation and the diagram is so that you understand that optimizing your lead flow can change the sales funnel and can turn the funnel into more of a cylinder. Your goal is to get the funnel to be as vertical or high of an angle as possible. Referral/Strategic Partners – Great quality, can be very consistent, and somewhat predictable. Search Engine Optimization – Can be great quality, pretty consistent and somewhat predictable. Social Media – Can be great quality, pretty consistent and somewhat predictable. Pay-Per-Click Ads – The most predictable lead source, can be great quality, and fairly consistent. Seminars – Can be great quality, and very predictable but not very consistent or nimble. Billboards – Can be great quality, pretty consistent but not very predictable. Television – Can be great quality, pretty consistent and very scalable and predictable. Word of Mouth – Not scalable, predictable and almost never consistent enough. Even though it is the cheap. Newspapers – Typically poor quality, not scalable, predictable and almost never consistent enough. Trade Shows – Can be consistent and great quality, but very expensive and not predictable. Radio – Medium quality and potentially consistent but not predictable. Public Relations – Great quality but not predictable and almost never consistent. * As a disclaimer, this list is as unbiased as I could be. Your opinion may vary, but this section is done under the criteria previously mentioned in this article of consistency, predictability, and quality. CRM: Customer relationship management tools are a dime a dozen and difficult to vet. Choosing this solution can be the difference between pain and relief. It is so important that we at Innovation Simple built our own custom software to manage our clients, projects, and business. Answering System: Sometimes answering services are the best bet here. These services are people that answer your calls for you and do what you tell them to do with the calls that are answered. There are also other VOIP systems, IVR and other tools to help you manage the receiving of calls from prospects. Sales scripts: Systems for how to answer calls, handle prospects, write proposals, setup calls and close deals are critical to the effectiveness of the leads that you generate and manage. Marketing reports: This is probably the biggest hole in your marketing metrics. You need robust reporting to help see what needs to be fixed and where to focus next. ___ The marketing systems of my business consistently produce enough of my ideal prospects to reach my sales goals. ___ The marketing systems of my business are predictable in that I can get more leads of my ideal client when I need them. ___ The marketing systems of my business consistently close the maximum number of my ideal client. ___ The marketing systems of my business consistently produce the financial metrics needed to insure my business is profitable. ___ The marketing systems of my business produce qualified clients in the time frame and rate that I need them. ___ The marketing systems of my business consistently produce happy, productive clients that love my products and services. So how did you rank? If your marketing system is up to par, you are experiencing consistent leads from predictable lead sources which generate the quality of prospect you are looking for. Chances are, your system could use some honing. For a free strategy session, we are only a phone call away.